Woolworths have just released a new range of Australian canned fruit - the fruit is picked and packed in Australia to support Australian fruit growers. Picked at its prime to ensure optimum freshness and maximum flavour, there are many varieties available including : Apricot Halves, Peach Slices, Pineapple, Apple or Pear slices and Two Fruits. 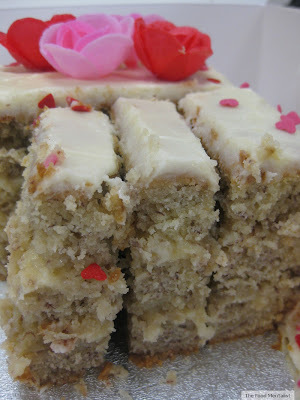 I chose to use the pear slices on this occasion in a delicious pear and almond cake ( see recipe below). What I really liked about the tinned pear slices is that they were already sliced and they were nice and firm not soggy or mushy like other tinned fruit I have previously tried to cook with. I also really like the fact that this new range do not contain any artificial colours, flavours or preservatives and they are available all year round. Grease and line base of a 26cm cake pan with baking paper. Sprinkle brown sugar over base. Melt 90g butter and pour over brown sugar. Top with overlapping pear slices. Place remaining butter and caster sugar in bowl of electric mixer, beat for 5 minutes until light and fluffy. Add eggs one at a time, beating well after each addition. Sift together flour, baking powder and spices, fold into egg mixture with almond meal. Stir in buttermilk, then mix to form a smooth batter. Carefully spread over pears. Place pan on a baking tray, cook for 1 hour and 20 minutes ( conventional) or approx 50 minutes using fan-forced oven. Use a cake skewer to check if cake is cooked throughout. Cover loosely with foil if cake begins to brown too quickly. Remove and cool for 30 minutes. Run a knife around sides of pan and carefully invert onto a plate. Serve with thick cream or ice cream if desired. 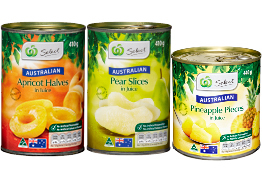 The Food Mentalist received samples of Woolworths Select Australian Canned Fruit for this recipe.